Central Atlanta Progress (CAP) and the Atlanta Downtown Improvement District (ADID) in collaboration with the City of Atlanta, Office of Design, Department of Planning and Community Development have teamed up to research and evaluate the history of Downtown Atlanta relative to extant built environment resources for the purpose of documenting Downtown Atlanta’s development generally between 1958 and 1988. To learn more about this growth and the resulting built environment, read Modern Downtown Atlanta, an approachable, well-illustrated booklet that documents the history of Downtown Atlanta as it was booming into the economic powerhouse it is today. Modern Downtown Atlanta was written by Patrick Sullivan and Dr. Karcheik Sims-Alvarado and designed by New South Associates, Inc. 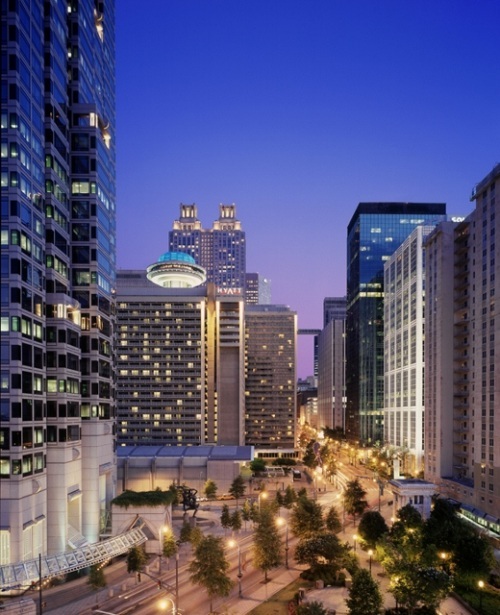 Downtown Atlanta underwent unprecedented development during the mid-twentieth century. While it can be assumed that this development was the result of a variety of factors and influences, it is necessary to precisely define and establish the associated historic context as extant resources constructed during this period become potentially eligible for the National Register of Historic Places (NRHP). There is potential for honorary recognition, including listing of individual buildings and district on the National Register of Historic Places, overseen by the National Park Service, along with other endeavors that might help better interpret the significant architectural legacy of Downtown Atlanta. In 2012-2013, the City of Atlanta completed its first survey of mid-twentieth century and Modern resources. Downtown Atlanta: Contemporary Historic Resources Survey Report documented extant resources constructed between 1935 and 1985 within an established boundary that encompassed downtown Atlanta. Now historic context research and analysis is underway to build on the initial report and define and establish the context of the inventoried resources. Based on eligibility for the NRHP, federal and state tax incentives are available for appropriate rehabilitation projects. These tax incentives provide a way for Downtown property owners to save money on rehabilitation, while also contributing to Atlanta’s preservation effort. To learn more about possible incentives and steps to apply, check out this information flyer. Project funding for this effort has been provided through a federal grant from the Historic Preservation Division of the Georgia Department of Natural Resources (HPD). This Downtown Contemporary Historic Resources Survey has been financed in part with Federal funds from the National Park Service, U.S. Department of the Interior through the Historic Preservation Division of the Georgia Department of Natural Resources. However, the contents and opinions do not necessarily reflect the view or policies of the Department of the Interior of the Georgia Department of Natural Resources, nor does the mention of trade names, commercial products, or consultants constitute endorsement or recommendation by these agencies. This program received Federal financial assistance for the identification and protection of historic properties. Under Title VI of the Civil Rights Act of 1964, Section 504 of the Rehabilitation Act of 1973, and the Age Discrimination Act of 1975, as amended, the U.S. Department of the Interior prohibits discrimination on the basis of race, color, national origin, age, gender, or disability in its federally-assisted programs. If you believe you have been discriminated against in any program, activity, or facility as described above, or if you desire further information, please write to: Office for Equal Opportunity, National Park Service, 1849 C Street, N.W., Washington, D.C., 20240.